The Spanish government's representative in Catalonia has apologised to those injured during police efforts to stop Sunday's independence referendum. But Enric Millo blamed the Catalan government for holding an illegal vote. Meanwhile the government in Madrid has issued a decree making it easier for companies to move their headquarters away from Catalonia. A Catalan minister told the BBC his government would go ahead with an independence debate in parliament. "Parliament will discuss, parliament will meet," said Catalan foreign affairs chief Raül Romeva. "Every attempt the Spanish government has used to impede things to happen, they have been demonstrated completely not only useless but counter-productive," he told the BBC in English. Does Catalonia want to leave Spain? 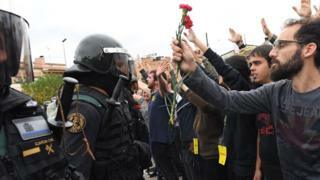 In the first apology by a Spanish government official over the violence on Sunday, which saw hundreds injured as police, trying to enforce a Spanish court ban on the vote, attempted to seize ballot boxes and disperse voters, Mr Millo said he could not help but "regret it and apologise on behalf of the officers that intervened". Friday has seen a number of political, business and judicial developments in the unfolding crisis in Catalonia. Catalan President Carles Puigdemont now plans to address the Catalan parliament on Tuesday at 18:00 local time (16:00 GMT), the speaker of the parliament says. Spain's Constitutional Court had earlier suspended the Catalan parliament session that had been planned for Monday. There is speculation that the parliament will declare independence unilaterally at its next sitting, based on last Sunday's disputed vote. The final results from the outlawed poll show 90% of the 2.3m people who voted backed independence. Turnout was 43%. There have been several claims of irregularities, and many ballot boxes were seized by the Spanish police. After a cabinet meeting, the Spanish government spokesman also expressed regret that people had "suffered consequences" during Sunday's vote - though he cast doubt on the numbers who had been injured. Íñigo Méndez de Vigo suggested that new elections in Catalonia might be a way to heal the fracture caused by the disputed referendum. Madrid's decree making it easier for companies to relocate their legal base away from Catalonia means such a decision will now not need the prior approval of shareholders. CaixaBank, a large Barcelona-based institution, has decided to move its headquarters from Barcelona to the city of Valencia. The bank said in a statement that it had taken the decision "in light of the current political and social situation in Catalonia"
This would ensure the banks remained within the eurozone and under the supervision of the European Central Bank, even if Catalonia broke away from Spain. Catalonia is Spain's richest region and accounts for 19% of Spain's GDP. Meanwhile, the Catalan chief of police, Josep Lluis Trapero, has appeared before a judge in a national criminal court in Madrid on suspicion of sedition against the state. His Mossos d'Esquadra force is accused of failing to help Guardia Civil police tackle thousands of pro-independence protesters outside the Catalan Economy Department in Barcelona on 20 September during the run up to the referendum. The Guardia Civil submitted an official accusation against the Mossos. In a statement, the Mossos said Mr Trapero had told the court that the force had not been made aware of the Guardia Civil action. "The Mossos were not notified sufficiently in advance... and this forced them to adjust to the circumstances accordingly. The first they heard of the Spanish police's intended action was through the media," the statement said. "Appropriate measures were taken ... In his opinion, he did not commit any crime of sedition or participated or collaborated in any such crime or any other." Another Catalan police officer and two leading independence activists, Jordi Cuixart and Jordi Sanchez, are also being investigated in Madrid. They all left the court after Friday morning's hearing without facing any Spanish restrictions. Leading newspaper El Pais says the allegation of sedition is extraordinary in post-Franco democratic Spain. As recently as August, the Mossos was being widely praised for quickly tackling the Islamist cell that carried out the Barcelona terror attack in that month. Video What will happen next? 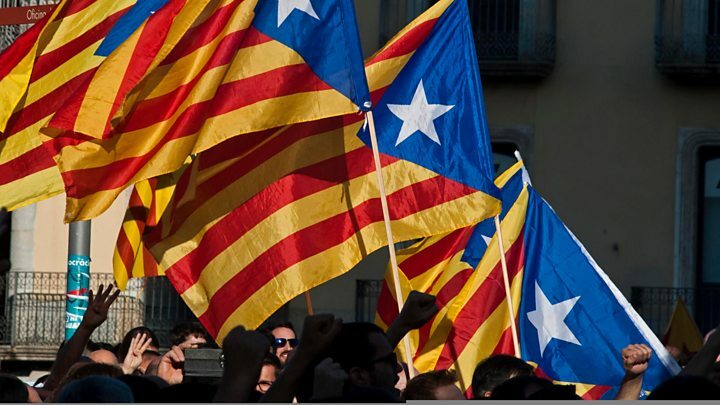 Catalan crisis: More populism than separatism?